Being one of the most important elements of bed linen, a traditional quilt is basically multilayered textile that consists of three layers of fabric: top, batting or wadding, and bottom. All these three layers are stitched by using the technique of quilting – a process of sewing two or more than two layers of fabric together. 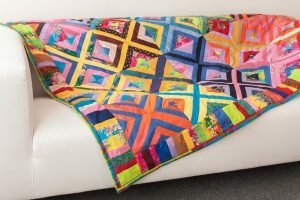 The top layer of the quilt can be stitched by using a single piece of fabric (it is called as “whole cloth”) but in many cases, it is crafted by using different small pieces of fabric stitched together to make a complex patchwork with various designs and colors. The middle layer, called batting is a layer usually of wool or fluffy cotton fibers or down or synthetic fibers and this layer provides quilt with a warm effect. The bottom layer is typically a solid, plain piece of a fabric or sometimes quilt-makers create special quilt patterns of it. The stitching of quilts can be simple and nominal or it can be complex or abundant. In the 21st century, quilts are usually displayed as an artistic endeavor and became popular for their artistic and aesthetic qualities instead for their functionality. Historically, quilts were usually used as the bedcovers and this usage still persists today. What are the different uses of quilts? There are many different traditions about the uses of quilts or quilt cover sets; for example, they are used to highlight the important events of life such as marriage, the birth of a child, graduation completion or family member leaving the home etc. In recent times, another common use of quilts is for bedding and it can also be used as tablecloths, table runners or wall hangings. The technique of quilting is also incorporated into designing the garments as well. Some of the reasons a person may decide to buy a quilt include bedding, decoration, and education, commemoration, documenting events, campaigning, artistic expressions, fundraiser or gifts. What techniques are involved in quilt making? It is one of the primary techniques in which geometric pieces of fabric are sewed to form quilt block patterns – a block design. This technique can be achieved with the help of hand stitching or with a sewing machine. It is one of the key components is the stitches that hold the three layers of fabrics of a quilt together. Quilting, a running stitch, can be achieved through hand or a sewing machine. The term appliqué originates from Latin word “applicō” meaning “I apply”. It is a sewing technique, commonly called as “ornamental needlework” in which different pieces of fabric in different shapes and patterns are stitched on a large piece of fabric so that a picture or pattern is formed. It is usually used for decorating purposes of textiles. This technique can be done by hand or machine. In this technique, the ground fabric cuts and then another piece of fabric is placed under this ground fabric, the raw edges of the ground fabric are tucked, folded and sewed to the lower fabric. 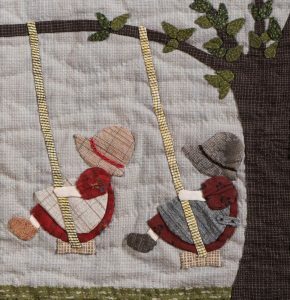 Different decorative elements such as piping, trim, sequins, and other objects are added to the quilt surface to give it a three-dimensional effect. The embellished cheap quilt cover sets are the best option if a decorative look is needed to give to the bedroom. In this technique, two layers of fabric that surround a batting layer are stitched together. 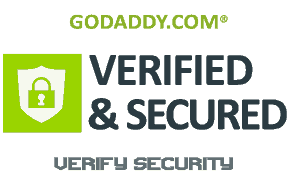 After that, additional material is added to that specific portion of the design that needs to be highlighted. The surrounding region is closely quilted so that the batting is compressed and the effect of the elevated portion can be heightened. This technique is commonly used when the designs or patterns consisting of complex shapes that have many sides and the in-set seams such as a hexagon, needed to piece. First of all, individual paper templates are cut according to the exact shape needed. Then, the fabric is folded and basted (temporarily stitched) around all the paper templates for stability. After that, all the different basted shapes are whip stitched together that forms larger shapes or blocks and ultimately a complete quilt. When the required quilt fabric is completed, the basted thread is cut and the paper templates are removed. 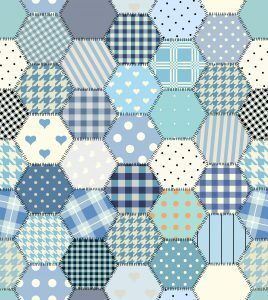 With English Paper Piecing, different tricky shapes such as pentagons, hexagons, octagons, or diamonds can be sewed together with the help of paper temples. Foundation Piecing is also known as Paper Piecing, a technique that is commonly used in making quilts. It involves stitching the fabric onto the paper foundation and this paper has lines and numbers that provide a guideline to the quilt maker to construct the block or quilt from start to the end. It is necessary to follow the given lines or numbers so that the final product can be achieved. What are different kinds of quilting machines? The first kind of quilting machines is the basic sewing machine. The fabric is simply push through the machine so that the thread and the needle go through the fabric for sewing. The second kind is called Long Arm machine that is used to sew all three layers top, batting and back together to give the quilt a finished look. With this machine, quilts can be decorated with different elements. Most of the quilt cover sets have designs on them crafted with the Long Arm machine. The modern quilting has become a genre of quilting and is stimulated by the internet. The modern quilting community is growing quickly with the easiness of connecting online. The modern quilting ideas involve modern aesthetic that includes innovative designs, patterns, colors and fabrics for manufacturing a quilt. With the passage of time, graphic design and bold colors will be seen in modern quilting. In recent times, quilts can be bought alone or in form of a complete quilt cover set that consists of matching pillows. For buying quilt cover sets online, Amsons Designs is one of the best online shopping stores that offer an exciting new range of quilts available in varieties of designs, patterns, colors, and fabrics.